Maintenance personnel have to facilitate optimum hydraulic system performance in their programme, hence the incorporation of oil cleanliness checks, or oil contamination monitoring should not be neglected. System efficiency can be achieved with proper contamination control, but the consequences of system or component failure can be ghastly. 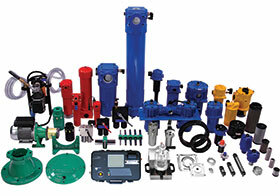 Hydrasales can help with low cost and effective filtration solutions. The MP Filtri range of hydraulic filtration and contamination monitoring products are designed to keep systems operating well. Custom manufacturing of filtration ranges for hydraulic systems are designed for equipment, including mobile. These ranges cover wide operating pressures, flow rates oil viscosities and meet the requirements of various international standard specifications. Tested at MP Filtri’s excellent research and development under extreme conditions, the company’s products are at the forefront of development and technology for the future. MP Filtri believes in acting as a partner for its customers and this facility is designed to assure reliability through planning, analysis and testing of the final product. This guarantees quality and reliability for existing filtration ranges and allows for new project planning and development tailored to customer needs. For over 39 years, Hydrasales excellent relationship with MP Filtri has given it access to proven expertise and solutions in the dield of hydraulic filtration.